Sorry about the lateness! This comic was a little more trouble than I expected. I had like 60 layers to deal with the clouds. Nevertheless, I like it! Did Skärva really expect a safe journey on the rainbow road? Too bad it wasn’t a reading rainbow. I bet the butterfly in the sky would have spared his face. I’m imagining The Second hosting Reading Rainbow in this world. yes it might have been late but this is like, one of the ones that made me laugh the most from this arc. Good stuff! Skarva says there’s nothing to be afraid of, nothing happens. She says there’s nothing to be afraid of, CRAP HAPPENS. Seriously Skarva, don’t close your eyes. You’re driving. What an electric turn of events! I hope Skärva doesn’t blow a fuse and charge through the castle with even more current than usual. It would be revolting to see the aftershock. 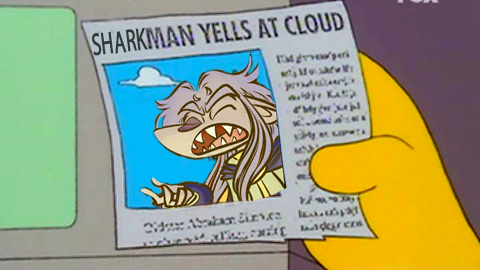 Never laugh at live clouds, you fools! 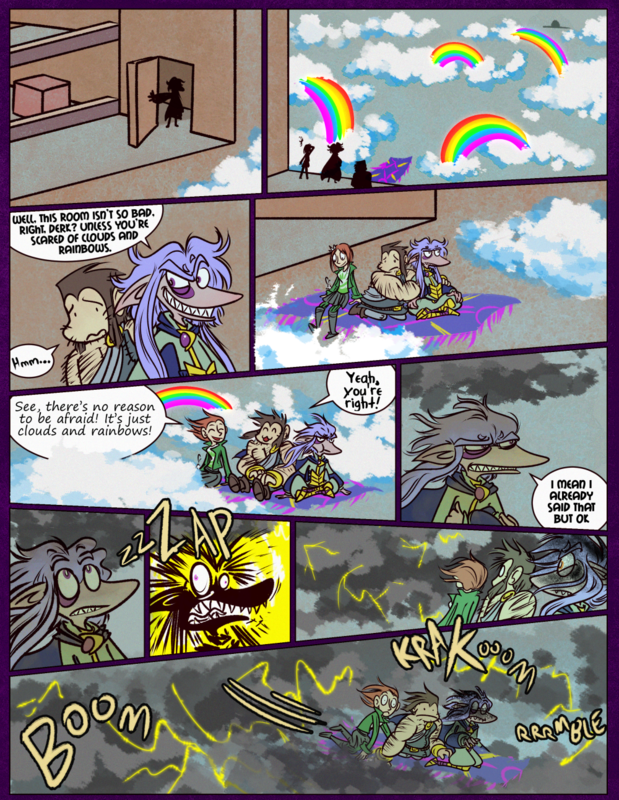 Panel 8, all I could think of was the sound effect of those duck guys getting shocked by the shockstick guys from spyro. I like how their hair looks all flowy in Panel 9, it really feels like there is motion going on. I like how your colors are turning out, though Skarva looks more duller than usual, before being struck by lightening.